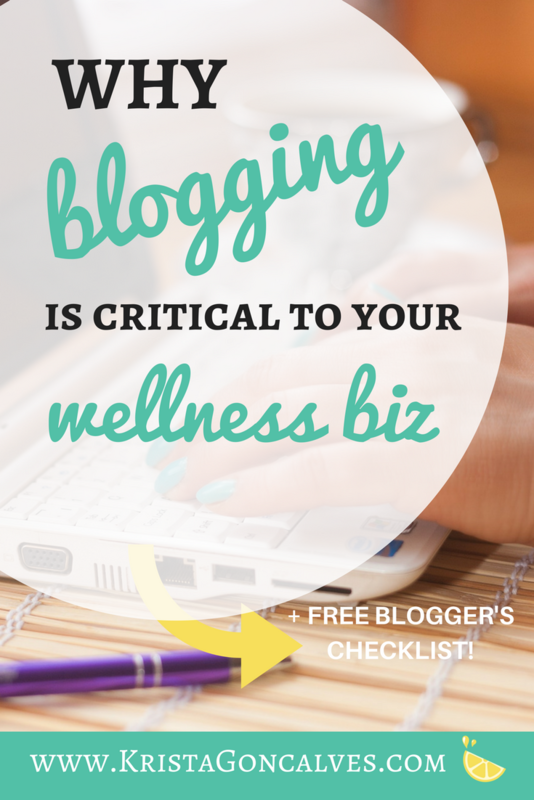 Do you really need a blog for your wellness business? Do You Need a Blog for Your Wellness Business? Blogging is as essential to marketing a business as coconut oil is to coffee, and if you haven’t adopted the practice yet (blogging, that is) – you may find yourself being quickly overshadowed by your fellow health biz bloggers and wellness business owners. On the other hand, if you are into the practice of it, then you know it’s not all rainbows & unicorns (or rainbow-unicorns), and it’s not even a sure-fire traffic driver to your website either. It takes planning, research, writing, commitment, dedication, and promotion – kind of like being on an online dating site. Ok, let’s lay this out for you with the Pros and the Cons of blogging for business, plus tons of tips to get you from fumbling newbie to BADASS BLOGGER! Let’s break ’em down…and be sure read right to the end to GRAB YOUR SWEET FREEBIE! Posting blog articles on the regular, that are helpful and informative to your audience, can make you the “go to” resource in your particular niche within the industry, which will subsequently give you client leads and up your conversion rates. Blogging gives you an opportunity to share your voice and personality, building up trust and increasing your brand’s “likeability” factor. Wondering what the heck are conversion rates?! It’s the rate at which your website visitors are “converted” into buyers, or even more generally, when they take any desired action on a webpage – not just buying from you. But, let’s aim for the type that converts to paying customers or clients! As I said, blogging is a good way to engage, and build trust with your target audience through high quality content that they find interesting and relevant. However, one of the most notable benefits of blogging is the opportunity for others to SHARE IT. With so many different sharing platforms these days, readers can share the blog link love by posting it on facebook, tweeting it, sharing on Google+, LinkedIn, Bloglovin, and the list goes on. Just be sure to use a social sharing plug-in to make it really simple and accessible for your new tribe – I’m currently using SumoMe. This creates the potential for viral traffic and rapid market growth. Can you say free marketing! When a business, or in most of our cases – a solopreneur, creates blog posts consistently, they are continuously providing search engines like Google, Bing & Yahoo with fresh content to index. This is also an opportunity for you as a business, to use relevant keywords that your ideal clients may use to search for the types of services, products or programs that you offer. For example: a Health Coach or Holistic Nutritionist specializing in digestive issues might write a blog post on SIBO (small intestinal bacterial overgrowth), an increasingly common health issue, and might use the keywords “natural treatment for SIBO” in order to reach their ideal clients who would likely search those terms. Brand awareness is an incredibly important element of marketing and blog posting will allow you to show your followers a more personal side of your business that existing and potential clients may not otherwise notice. Remember that YOU are your brand…whether you like it or not! Use snippits of it as promotional copy in social media, chunk it out into a newsletter or conversely, pull together several blog posts and create an e-book to offer as a freebie opt-in lead magnet or even sell as a low-cost product. BOOM! Already have a website, and just think you’ll start a separate blog site? STOP SKIMMING & READ THIS!! By not having your blog integrated into your main business website, you’re losing out what will likely be over half of your website visitors. ACK! Just. Don’t. Do it. 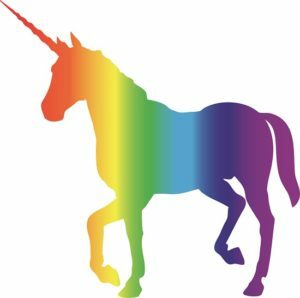 Like I said, it’s not all rainbow-unicorns when you do finally get down to blogging, and here are some of the reasons why it may feel like an intangible mythical creature to some people. It does take up a considerable amount of time, and if you’re not sticking to an editorial schedule AND being consistent, then it can certainly work against you. Basically, with blogging, you’re either in or you’re out. There’s really no half-assing it. Fresh Topics – but what will you write about?! It’s hard to continuously come up with new topics and what to write about each week! Niching down will help you to be more focused and specific when it comes time to write your blog posts, e.g. rather than being a “health blogger” who writes on ALL health topics, write for a more specific and targeted audience like women 30-50 years old who have hormone issues. When you hit on a niche that really speaks to you, like hormones was for me, you’ll be surprised at how many topics you can come up with! Stale, boring or poorly written content can certainly work against you, so be sure to take steps to pump up your writing style and subject matter. Take care to use proper spelling, punctuation and grammar. Proofread, edit, then do it again. I always read my post out loud before publishing it, as if I was using it as a script at a speaking engagement. This helps to catch awkward phrases and tweak things a bit further. If I Build It…what will they do, exactly? The thought that “if I build it, they will come” is simply not the case – blogging is not an instant traffic driver nor is it an automatic lead generator! In fact, many bloggers say they spend 20% of their time creating content (like blog posts), and 80% of their time promoting it. Also, blog posts are NOT SALES PAGES, in case you were under that impression. Someone is going to disagree with you! There’s always going to be negative people and internet trolls out there, but don’t let that, or any of the other reasons deter you from getting started. Ok, now that you’ve likely made up your mind about getting a blog started, or that you’re now going to crack down on a neglected one – let’s squeeze out some more juice from this post! Why am I starting a blog, and what do I need to get out of it? Who is your target audience? What are their pain points? What specific topics will you write about? Ideally, they involve solutions to their problems! What is unique about your blog, compared to the gazillions of other health & wellness blogs out there? How much time will you devote to blogging, and other content writing? Where will you schedule in this content creation? How often, and what day(s) will you publish, and how & when will you promote them? 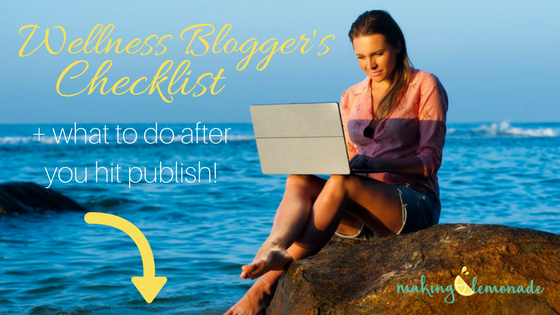 Then brainstorm a list of topics, hash them out, organize, schedule and get to writing…BECAUSE NOW YOU’RE A BLOGGER! Batch writing when you’re “in the zone” is really the best strategy to just get them done. I once wrote an entire month’s worth of blog posts in a day…I did it, once. I personally aim for once per week (about 4 posts per month), but some do more, and some do less. I always publish on Tuesdays – no rhyme or reason to that date, just keeps me on-task and accountable every week. 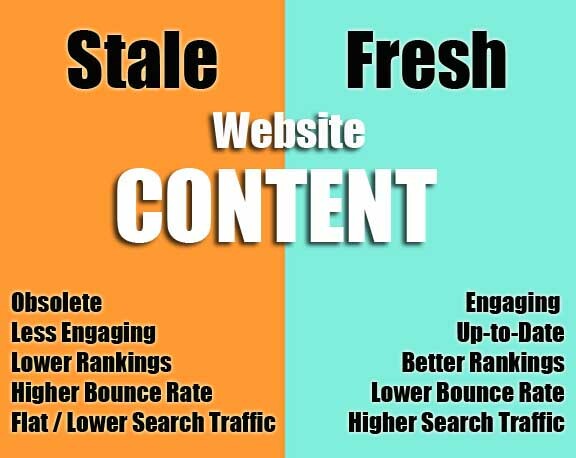 The main point is to post fresh content frequently, and above all else – BE CONSISTENT! Your readers will come to expect a certain standard and schedule from you, like when they can read your next juicy post! By providing your unique spin and insights on a particular topic, you can organically grow your traffic, your potential client’s trust and ultimately, leads and conversions (sales!). And the best part is, you don’t even need to have a full website before starting a blog – so go ahead and get your blog on!